Crimes against identifiable groups in Canada have spiked sharply, according to the latest data from Statistics Canada on police-reported hate crimes. Jews and Jewish institutions were the foremost targeted group, but hate crimes against Muslims comprised the largest increase. Across Canada, there were 2,073 police-reported hate crimes in 2017, an increase of 664 incidents over the previous year. Almost half of all hate crimes were reported in Ontario. In British Columbia, 255 hate crimes were reported to police, including 68 that targeted Jews, 36 incidents against black people, 19 against Muslims and 18 crimes based on sexual orientation. Reported hate crimes against the Muslim, black, Arab or West Asian and LGBTQ+ communities all increased nationwide. 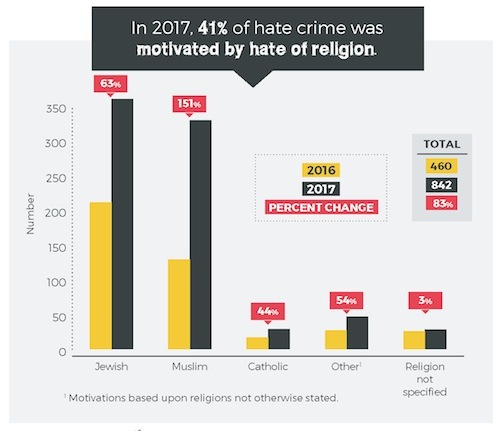 Across the country, hate crimes against the Jewish community rose by 63% between 2016 and 2017 – from 221 incidents to 360 – and the Jewish community remained the most frequently targeted group in both absolute and per capita terms, the report stated. Hate crimes against the Muslim community increased 151% between those years, from 139 police-reported incidents in 2016 to 349 in 2017. In one of few comparatively bright spots in the report, violent incidents decreased as a proportion of all hate crimes, accounting for 38% of reported hate crimes in 2017, down from 44% in 2016. But this proportional decline is tempered by the raw numbers. The actual number of violent hate crimes increased 25% but decreased as a proportion of hate crimes overall only because the number of non-violent crimes increased that much more – non-violent offences like mischief and public incitement of hatred increased 64%. Of the 360 police-reported crimes against Jews or Jewish institutions across Canada in 2017, 209 of those were in Ontario and 49 in Quebec – making British Columbia not only the second province in raw numbers of anti-Jewish attacks, but almost tying Ontario on a per capita basis and surpassing all other provinces by far. Hate crimes in Canada have been creeping upward relatively slowly since 2014, according to Statistics Canada, but 2017 saw a leap of 47% over the previous year. Most of the crimes involved hate-related property crimes, such as graffiti and vandalism. Despite the large increase in 2017, however, hate crimes still represent a very small proportion of overall crime – about 0.1% of the more than 1.9 million non-traffic crimes reported by police services in 2017. That said, a 2014 Statistics Canada study, General Social Survey on Canadians’ Safety (Victimization), in which Canadians self-reported incidents of perceived hate crimes, indicated that two-thirds of such incidents were not reported to police, suggesting that the numbers in the hate crimes reports might underestimate actual incidents substantially. Hate crimes against Muslims, particularly in Quebec, contributed significantly to the overall spike in 2017 reported incidents. Hate crimes in that province increased 50% over the previous year, with incidents targeting Muslims almost tripling to 117 reports in 2017 from 41 the previous year. Perhaps most disconcertingly, the biggest spike in anti-Muslim incidents in Quebec occurred in the month following the mass shooting at the Islamic Cultural Centre of Quebec, where six Muslim men were murdered in a shooting rampage on Jan. 29, 2017. In response to the statistics, which were released Nov. 29, the Centre for Israel and Jewish Affairs called on the federal government to take a three-pronged approach to hate-motivated crime and related matters. The news is not good. Hate crimes are up almost everywhere in the world one cares to look. A Statistics Canada report on police-reported hate crimes in Canada erases whatever smug superiority Canadians may have been feeling when watching rampant racism south of the border, at least some of which seems a result of the licence granted by a president who flirts with the most incendiary elements in U.S. society. The number of hate crimes reported to Canadian police in 2017 far outstripped the number in 2016 (see story, page 1) – and the actual number of hate-motivated incidents may be up to three times larger than the number reported to police. Similarly terrible phenomena are taking place across Europe, where xenophobic and racist rhetoric is manifesting into violence against Jews, Muslims, Roma, asylum-seekers from Africa and Asia and, really, anyone who does not fit an escalating nationalist and populist consensus. The lines are not all clear, either. The perpetrators and the victims can, at times, overlap. In online posts, email threads and private conversations, we witness members of our own community attributing motives to entire groups of people, and spreading hatred based on religious or racial identities. Likewise, messages of anti-Jewish hatred are common in online locations addressing the Israeli-Arab conflict, often including antisemitic comments from members of victimized minority groups. The range of hate-motivated incidents addressed in the Statistics Canada report varies – most are non-violent and involve graffiti or crimes against property. But, when they are violent, they strike with a precision that aims at the emotional, as well as physical, vulnerabilities of the victims. In three of the most horrific hate crimes of recent years, assailants struck in the very places where people should expect safety – in the spiritual sanctuary of Emanuel African Methodist Episcopal Church, in Charleston, S.C., where nine African-Americans were murdered by a white supremacist on June 17, 2015; at the Islamic Cultural Centre of Quebec City, a mosque, where six people were murdered by an Islamophobic killer on Jan. 29, 2017; and at the Tree of Life synagogue in Pittsburgh, where 11 were murdered during Shabbat services this past Oct. 27. The idea that people should be safe in a place of religious observance seems to be precisely the reasoning behind such attacks. But there is another form of violent crime that seems oddly excluded from this discussion. Thursday (Dec. 6) marked the 29th anniversary of the mass murder at the École Polytechnique, in Montreal, where 14 women were killed by a man with deep-rooted hatred against women. A commemoration took place at the Vancouver Art Gallery, in recognition of the annual National Day of Remembrance and Action on Violence Against Women, with empty shoes representing the 545 women who have been murdered in British Columbia between 1997 and 2015 (the last year for which reliable statistics are available). These victims include some of Canada’s murdered indigenous women, women working in vulnerable situations and women who were murdered because they were women and members of another marginalized group. Others were murdered by their domestic partners. In probably all of these cases, issues of differential power (of various forms) and attitudes about the value of women’s lives, factored into their fates. They are victims of gender-based violence. It seems strange that, in a discussion about hate-motivated crimes, we exclude an entire gender, whose experience with violence is as prevalent, or more so, than that of other identifiable groups. This is not an attempt to detract from one or another group’s experience with violence to emphasize something else; it is more an attempt to emphasize that every life should be respected and that membership in an identifiable group often diminishes that respect in the eyes of perpetrators. But neither should the universal idea – every life is sacred and every individual deserves respect – detract from the more particular issue at hand. Every life is sacred and every individual is deserving of respect, but membership in particular groups can disproportionately impact on one’s experience with violence and discrimination. So, while we should be always conscious of the universal, we should likewise militate against the particular bigotries and prejudices that lead to disproportionate victimization of identifiable groups. In Canada and around the world right now, humankind could benefit from more emphasis on both the universal and the particular.